If you have a Digital Bytes suggestion, please contact Jamie at jmatczak@wvls.org. Jamie shares how easy it is to schedule Facebook posts. It’s starting to feel like Spring! And with that is a great time to do some cleaning up on your library’s website. Anne gives some tips in the latest Digital Byte. Description:Anne talks about using Pressbooks as a tool that people can use to publish a book. It was the tool provided to assist with submissions for the Wisconsin Author Project. Description: Jamie talks about how she uses Boomerang to help keep her email organized. Description: Jamie shares how you can protect a document with a password. Description: Jamie talks about Dropbox, and how she uses it for library collaboration. Description: Jamie talks about her 8 favorite tech tools at the moment, and how they might help you in your library work. Description: Jamie talks resources that are available in continuing education. Description: Jamie talks about a great feature to help library patrons determine which internet service providers in Wisconsin can be affordable. Description: Anne talks about how to use this great tool as part of EBSCO databases. Description: Jamie talks about solutions on working with colleagues who challenge us. Description: Anne provides tips and tricks to immediately improve your library’s website. Description: Using five characteristics with examples, Jamie explores what it means to have a strong work ethic in your library. 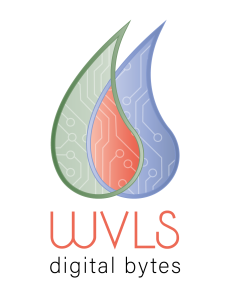 Description: Anne gives an overview of the WVLS website, and how you can easily find the resources and items that you need. Description: Jamie talks about some simple ways to make your library work culture more positive. Description: Anne walks you through creating beautiful images for your library, using a free online tool called Canva. Description: Jamie shows you how to make your library logo transparent for use in marketing purposes. Description: Anne shows you how to use Google Cardboard Glasses and talks about virtual reality. Description: Jamie talks about QR codes. What are they? Why are they used? And how could you use them in your library? Description: Anne walks through free using this app and marketing toolkit, developed by the Bridges Library System. Description: Jing is a free screencast tool that is great for capturing images or video. Learn how to do both in this Digital Byte. Description: This Digital Byte focuses on using Dashboard and its statistics, available on the WVLS website. Description: Learn how to set up a poll using Doodle, a free online tool. It also shows you how to share your poll, as well as the results of your poll. Description: Learn how to book a WVLS Makerspace kit for your library with step-by-step instructions. Description: This byte focuses on customer service in the library, and more specifically, how we can best communicate with patrons and colleagues over the phone and via email. Description: This byte focuses on customer service in the library, and more specifically, how body language and facial expressions can have an impact on the service we provide. Description: This byte focuses on how using positive language can improve library service. What phrases should we be using regularly? Which ones should we avoid?